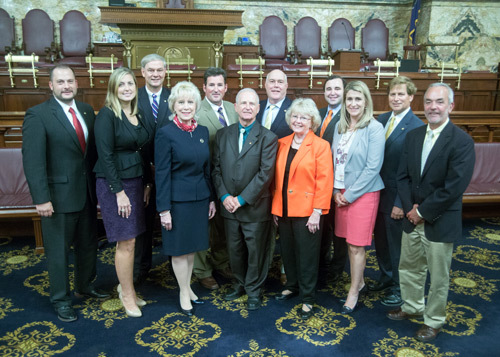 HARRISBURG – To ensure that Northeast Pennsylvania has a strong and effective voice in the Pennsylvania House of Representatives, the 12 members representing parts of 13 counties in this region of the state have banded together as a delegation to fight for the issues that matter most to the area. The delegation is being chaired by Rep. Karen Boback (R-Lackawanna/Luzerne/Wyoming). “We know that strength does lie in numbers, and that’s why we felt it best to join collective forces and use our delegation as an agent of change that will ultimately benefit our region,” the members of the delegation said. Since its founding at the beginning of the 2017-18 legislative session, the group is actively fighting against any new tax increases but is also working toward lessening regulations that suppress jobs and commerce, reform property taxes, enhance educational opportunities, improve health care access and affordability, support responsible development of natural gas opportunities with an emphasis on environmental protection, further enhance agriculture development, and improve technical and vocational education that creates job readiness. “Northeastern Pennsylvania is a vibrant region whose needs can sometimes be overshadowed by Pittsburgh or Philadelphia, and with a dynamic group of legislators working together, we can make impactful changes that stand to benefit our region,” the group of legislators said. Members of the delegation include Chairwoman Boback, along with Reps. Matt Baker (R-Tioga/Bradford/Potter), Rosemary M. Brown (R-Monroe/Pike), Garth Everett (R-Lycoming/Union), Jonathan Fritz (R-Susquehanna/Wayne), Aaron Kaufer (R-Luzerne), David Millard (R-Columbia), Michael Peifer (R-Pike/Wayne), Tina Pickett (R-Bradford/Sullivan/Susquehanna), Jack Rader (R-Monroe), Tarah Toohil (R-Luzerne) and Jeff Wheeland (R-Lycoming). The delegation reflects a variety of seniority, with three of its members being chairmen of House standing committees: Baker chairs Health Committee, Millard chairs the Tourism and Recreational Development Committee; and Pickett chairs the Insurance Committee. To ensure that Northeast Pennsylvania has a strong and effective voice in the Pennsylvania House of Representatives, the 12 members representing parts of 13 counties in this region of the state have banded together as a delegation to fight for the issues that matter most to the area. Members of the delegation include (back row, from left): Reps. Matt Baker (R-Tioga/Bradford/Potter), Michael Peifer (R-Pike/Wayne), Jeff Wheeland (R-Lycoming), Aaron Kaufer (R-Luzerne), Jack Rader (R-Monroe); (front row) Jonathan Fritz (R-Susquehanna/Wayne), Tarah Toohil (R-Luzerne), Chairwoman Karen Boback (R-Lackawanna/Luzerne/Wyoming), David Millard (R-Columbia), Tina Pickett (R-Bradford/Sullivan/Susquehanna), Rosemary M. Brown (R-Monroe/Pike) and Garth Everett (R-Lycoming/Union).